We are Mercedes Benz car key specialists, most vehicle locksmiths do not cover Mercedes, this is because of the large investment required both in equipment, and in the expertise to enable the production of Mercedes car keys. 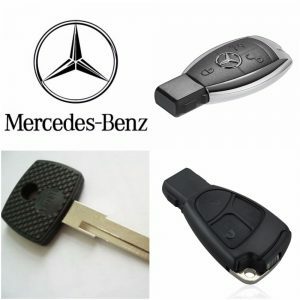 We can produce Mercedes car keys either as a spare key, or in a lost car key situation, where there is no key at all. if you have no keys or the key you have no longer works we can help, and being mobile locksmiths we come to your location to carry out the work, meaning you do not have to recover the car back to the dealer. Mercedes car, van, or truck, we can supply, cut and program a new replacement key, and we can do the job today… no waiting and no fuss. If your Mercedes car key is damaged, has stopped working, or may be you have washed it in the washing machine (yes this happens a lot!) then we can help, we do not do repairs to car keys as usually by the time a car key needs a repair it is past its best … and obviously if a repaired car key fails it is never going to fail when your at home and don’t need to go anywhere … so we provide brand new replacement Mercedes car keys.